From time to time the question of strings arises on our Facebook group and, each time, I pitch in with my views. I thought it might be worth doing this one more time, but in a more permanent place (you know how those Facebook posts rapidly disappear off the bottom of the page). A caveat before I start: I’m wrong on most of what I say and I’ll probably change my mind before I’ve finished writing it. You’re wrong too. Or perhaps you’re right. Maybe we’re both right. The thing with strings is that most of it is a matter of taste and personal preference. There’s a comments section below when you can get involved in the debate. These are the issues that Jeremy Vine and the Daily Mail website fear to tackle. Do I need to change my strings? Maybe. Uke strings last for ages, though, and they’re not like guitar strings which are subject to higher tension or being thrashed with a plectrum. (Oh, you don’t use a plectrum on uke, do you?) They don’t suffer from dulling as noticeably as guitar strings do either. Guitarists will know about this; when you put new strings on your guitar it sounds all lovely and zingy, but a couple of weeks later it sounds rubbish again. If you’ve had your strings on for longer than a year then have a look and have a listen to them. Do they have pits in them from being pressed against the frets? Are they dirty, covered in beer, sweat and pork scratching dust from nights in the back room of the Prince? This corrosive combination is what usually does for my strings. If they’re showing signs of physical wear then replace them. Do you know the brand of your current strings? Cheap ukes will keep the costs down by stringing them with cheap strings. You can often tell this if all the strings have the same thickness. A proper set will vary with increasing thickness or gauge as pitch rises. If your uke came with unbranded cheap ones, you should probably replace them. Fancier ukes will often have a tag tied to one of the machine heads telling you that your new purchase is strung with such-and-such brand of strings. A word of warning though. If you are going to change your strings, don’t do it it just before a gig. They will take a while to stretch in and settle and you’ll be spending about a week tweaking them up a bit. For this reason when you do replace them, you won’t need to put more than a couple of turns around the machine head (tuning peg). By the time they’ve stretched you’ll end up with a big lump of string around it. What size strings should I buy? What size is your uke? That size. Just buy the correct size and be done with it. Low G or high G? In replacing the g with a thicker, lower, string you are increasing the range of notes you can get, down a whole five semitones, so our lowest note is now on the G.
There are a number of factors to consider when deciding to go low G or stay with the standard high G. What size of uke do you play? If you play a soprano then frankly don’t bother trying. Strings are generally difficult to find and will sound wrong. If you play a concert then maybe, if you want. Personally I’d only consider it as an option on a tenor as there’s more of a bass response in the overall tone of the instrument to make it worthwhile. If you play on your own I would also advise against it. On its own it can sound odd as the root notes of your chords may sometimes come out wrongish. I’ll explain why when I give some tips on playing with a low G, below. If you play with a group then maybe consider giving it a go. However, look at the rest of the group and listen. At Moselele, I was probably the first to give it a try. I found it a positive thing as it added another dimension to our sound and personally it didn’t feel like I was playing the same as everybody else. It’s important to be in time and fit in but it can sound dull without any variation across a large group. Over time I’ve noticed a bit of a shift and an escalation within the group. Not sure if it’s a bloke thing – bigger ukes, more bass – but there was a point where it was looking like more and more people were going low G on tenors. It might be because we’re quite a large and loud group so hearing yourself becomes more difficult and going for power and volume end up being a solution for people. Partly for this reason, I got myself a soprano recently and discovered the sweeter, lighter and higher tone of that will come through for me when it all gets a bit heavy. 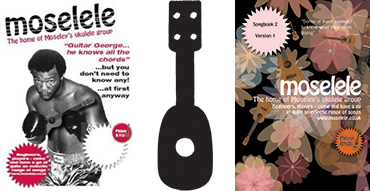 Ultimately a group ought to have a range of variation across the sizes of ukes and have a few low Gs, but not too many. I mentioned earlier about playing tips. Playing low G does come with some responsibility. You don’t want to dominate or stand out in the wrong places when playing in a group. You have to blend. You need to bear in mind that the shape of uke chords are generally built around the fact that the lowest note available is usually on the C string. Chords are generally built upwards from the lowest root note. So in a C chord then the lowest string sounding is the C. However, if you go low G, all of a sudden that C chord has a great booming low G note in it which can sound odd. As a guide, if the G string isn’t being fretted then you’re going to have a low G note evident in your chord which you might not want. So if the G isn’t bring fretted then I’ll bring my thumb up round the neck to dampen it. You generally can’t go wrong with Aquilas. They make fine strings and they seem to be the standard by which all others are judged. They’re the de facto brand that come on decent ukes and there’s often a tag tied to the machine heads to indicate this. 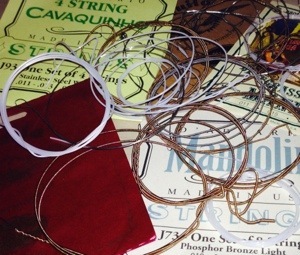 Strings used to be made from catgut. Most of us uke players seem to have cats so that’s a bad thing. We live in the future now so synthetic strings long ago took over from catgut. Aquila use something called Nylgut (nylon gut presumably). I’ve not tried them myself, but the other premium brand on the market are Worth. These are a fluorocarbon string and come in clear or brown varieties. People speak highly of both. All the other major string companies make uke strings – La Bella, Martin, d’Addario. 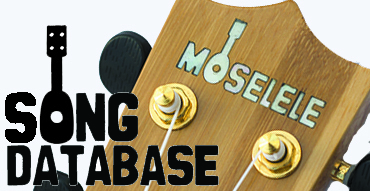 If you’re a fan of those brands from other instruments you might play, then consider them. Don’t go buying polyester strings. They’re the cheap and nasty ones that get put on cheap ukes. If you fancy a splash of colour then you might want to take look at Aurora, which are supposedly a silkgut string made by Aquila but dyed by Aurora. They come in a range of bright colours, or you can get a multicoloured set. Our local music shop in Moseley, Shades, also produce a set of nylon rainbow strings as part of a music teaching scheme for kids. I’m not convinced that distinguishing between strings with colour, or anything else for that matter, is an effective teaching method but if it’s a gimmick that gets kids interested in learning to play, then that’s got to be a good thing. 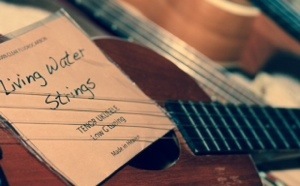 A couple of months ago I decided to try some Living Water strings produced and distributed by Ken Middleton. These are a clear fluorocarbon string, slightly thinner in gauge than the Aquilas and a little quieter. A lovely bright and clear tone though. I’ve had a low G tenor set of Living Water strings on for almost three months, which is a record. I really like them. Ken produces a range of different sets for the various sizes in low and high G variations. I also like the fact that this is more of a cottage industry by somebody who plays and is active on the uke scene, rather than a product of a large company shifting units. Your local music store, Amazon, eBay… caveat emptor, as always. You’ll find that an eBay search generally turns up a store for several of the below anyway. It’s worth paying a quid or two more to be sure you’re getting what you expect from a reputable dealer but then you may as well buy direct from their proper sites. Presumably they get a few pence more per sale if you cut eBay out, and it’s always worth supporting the companies that support your hobby. Southern Ukulele Store are always good. Eagle Music are my personal favourite and have always been quick to deliver. Shades Music in Moseley for the rainbow strings if that’s your thing. Ken Middleton for Living Water. I know that cheap ukes have received a lot of scorn all over the Internet but most of us started playing with one of these “toys” and I have bought several for people as presents. BUT the one thing that I would add to this article is that in many cases, a £25 “toy” uke with a £7 set of Aquila strings often makes a perfectly serviceable first instrument. ALWAYS change the (usually black) strings that come with such ukes – it will make a hell of a difference! Hi Dave, I’m doing exactly what you recommend, ie, changing the strings on my “toy” uke for Aquila, but I don’t know where to place the thick string in the packet. Can you advise, please? If you’re holding the uk as if you were playing it, the thickest string (the C string) should be the second one down. So they should be G (at the top) C E A. Ukes are unusual in having the thickest (or lowest string in tone) in the middle. Sorry missed this. I’m not really sure of guages in terms of numbers but there are loads of different types on the market.